With the development of a civilization and advances in science, the lifestyle of the people progresses at the expense of healthier and simplistic options. Simple and healthy food has been replaced by fast food options, children’ frolicking in parks and playgrounds have been replaced by televisions, computers and play stations. Even the means of commutation has been replaced by faster motorized options. All this has happened mostly at the expense of people’s general health, giving rise to a plethora of lifestyle diseases that affects complimentary to the level of urbanization of a society. The city of Bangalore has seen an exponential growth since the end of 1990’s, due to the rise of IT industries. People in this city are daily groping with aspirations of ever rising needs and vanity. Access to bigger cars and expensive devices has left limited options of pursuing avenues of healthy physical activities. However, there has been a recent renaissance of a kind in Bangalore in search of maintaining a good health. More and more people these days are reverting to the days of the old bicycle riding. Along with the beautiful temperate weather of the city, more and more enthusiasts are adopting this activity both for leisure and also as a means of daily commute to their engagements. Regular cycling can help one to loose weight with increase in fitness. It also acts as a de-stressing catalyst. In present times Bangalore has seen many good cycling clubs, who provide commitment to redefine cycling experience for the citizens. Few of the well known clubs are, Bums On The Saddle, SICL-Cycle, Bangalore Trekking Cub, Bikes Zone Cycling and Bangalore Cyclist Groups. All these clubs are providing hands-on assistance to members interested in learning safe and professional cycling. There are proper coaches who help enthusiasts in purchase of proper gears and train them with small in house training sessions. The cycling activity has become a status symbol for a stratum of population in the city. People are investing in cycles costing between Rs 3500/- to Rs 100,000/- or even more. Luxury bikes have been replaced by modern bicycles which are of varied types like Hybrid, Road, BMX, MTB and Speciality. On this day the cyclist clubs join hands along with the state administration and organize Campaigns at Cubbon Park and Yelahanka. 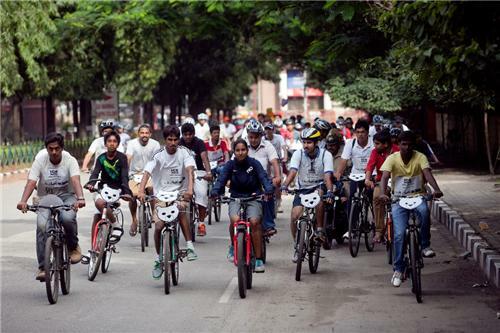 Recently Yelahanka witnessed a huge carnival on 3rd August, 2014 when the entire residential community of these localities joined hands and celebrated a Cycle Day in collaboration with Times of India. Nearly 3000 cyclists crowded beside the Allasandra Lake to celebrate the joy of cycling. To provide a holistic sense to the spirit of a big carnival, many other sports and competitions are also organized at the backdrop of the main cycling event. Let us all promote Cycling which in turn will help to curb pollution problems along with make people healthy.